PCM’s Large Cap Total Return (“TR”) strategy seeks long term capital appreciation while providing and above average level of dividend yield. The TR strategy is invested primarily in equities in the $10 billion and higher market cap range. We consider the S&P 500® index as the primary universe from which we select securities for the TR strategy and therefore we sometimes invest in equities with market caps below $10 billion. 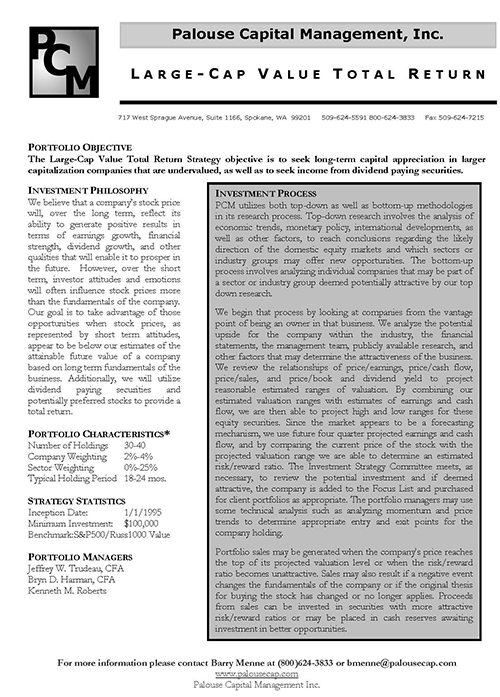 PCM’s TR strategy is team managed using our fundamental value process..
Palouse Capital Management, Inc. is a 100% employee owned registered investment adviser offering a comprehensive range of investment strategies to a broad audience of equity investors.